We’re extremely proud and pleased to announce that Dead Synchronicity: Tomorrow Comes Today has just been released for the awesome Nintendo Switch and can now be purchased via the Nintendo eShop. When we first heard that the Nintendo NX (which, as you all know, eventually turned into the Nintendo Switch) would feature this awesome mix of handheld and desktop console, we immediately thought Dead Synchronicity: Tomorrow Comes Today would be a great addition to the console’s line-up of games. Back then, we were working on the PS4 port, shoulder by shoulder with Badland Games, adapting the mechanics and interface to the Sony console. The PS4 version was released a year ago, and so far players and media are loving it (it’s rated with 4,5 stars out of 5 on the Playstation Store!). So, now that we have feedback, we know for certain that Dead Synchronicity: Tomorrow Comes Today is as enjoyable on consoles (if not more!) as it is on any other platform. A few months ago, as soon as the Nintendo Switch was released, we tried it…, and instantly fell in love with this small, awesome video games console. And, well, considering the great experience that gamers are having with the PS4 version, we knew it would be the perfect platform to port the game to. 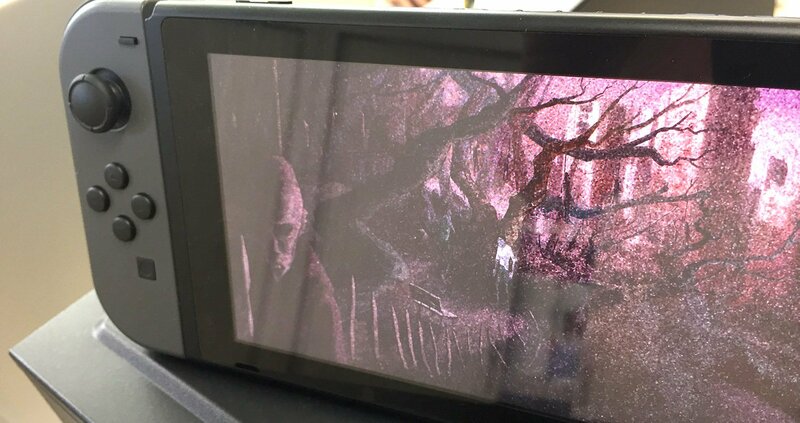 Michael is having one of his grainy, distorted visions… on a Switch! So, with the support of Badland Games and the collaboration of our friends at Stage Clear, we’re really glad to say that Dead Synchronicity: Tomorrow Comes Today is available to buy now via the Nintendo eShop! I really enjoyed the game but it ended so suddenly, please tell me there’s a sequel coming. Yes, the sequel, The Underground Highways, is under development, and progresses slowly but surely. Hope we can post some news about it soon! I played it with my girlfriend in her Dorm in a cours of a week or two, on my Switch. It was incredibly absorbing and the atmosphere made us feel like we were placed right in this world, together with Michael. we talked about the game weeks to come and still many months after playing it we get back at it every once in a while and in these talks, in every single one of them we tell one another how great a Prequel would be and fantasize about how it`s going to be. so with that in mind i think it`s understandable that the confirmation of The Underground Highways was like a dream comming true for us. We hope we can post some stuff about its sequel, The Underground Highways, soon. Meanwhile, have you played the free, short prequel, The Longest Night? It’s only available for PC (Windows, Mac & Linux) and it’s a text-driven adventure game that will let you play Michael again for a little while. I just finished TCT on the Switch and wanted to comment. Really loved this game. Point ‘n’ Click adventures are one of my favorite genres and I’m glad to see a resurgence with Dead Synchronicity and Thimbleweed Park appearing recently. The story was excellent and engrossing. I played it pretty much non-stop over a couple of nights until I finished it. I love dystopian fiction, and you don’t get much more dystopian than the world that Michael finds himself in. Really looking forward to The Underground Highways. Definite day one purchase! Keep up the good work guys and please keep producing excellent titles like this one!